My co-workers bithday is tomorrow and I wanted to make a card for her. I made this card using The Ultimate Crafter's Companion which is now one of my new favorite tools. I comes with this awesome, easy to follow video and I love all the projects that it has on it. I put a few stickers on it just to make it even cutier. I bought the ribbon for a $1 at Walmart. Awesome score. The pictures don't show how this card really comes together but I hope you can get an idea. Here is the card streched out. The top of the opened card. The bottom of the open card. It came out so amazing. It was so easy to do but it looks like you spent a whole lot of time on it. I just love these Fairies! The card is pre-made from the Fairyopolis Complete Cardmaking Kit. This kit is amazing. Instead it has an idea sheet or you can put it together anyway you choose. You don't even have to make a card you can make a scrapbook page or just look at some of the amazing things this design team has put together. This cute little fairy was so easy to use. It is from the Fairyopolis 6" x 12" Die-cut Decoupage Sheets. You just punch them out and put them together. They are so easy to do and they look like you spent hours designing them. To attach the fairy and butterflies I used my new favorite Collall Silicone 3D Kit. You really should check out all of the beautiful stuff that is available from Crafter's Companion USA and all the awesome stuff from the Fairyopolis collection. So amazing! I made this baby album as a late baby shower gift for my cousin. I didn't make it to her shower but I figured everyone needs a photo album for their new addition. I love how this album came out and I can not wait to see if all put together with some very cute baby pictures. I used my Gypsy and Gypsy Wanderings cart to make this adorable baby flourish for the front of the album and I also added some bling too cause I love me some bling. Here is one of the pages. This is the front page. I thought it was adorable. Instead of Easter baskets this year my kids get Easter pails. The bunny & chick were cut using Simply Charmed Cricut cartridge. The egg was cut using Designer's Calendar Cricut cartridge. I of course had to put some cute little Peachy Keen faces on the characters to bring them to life and make them look so adorable. I made this photo album for my daughter. Her favorite color is green so that is why I chose this color album. I used my Gypsy to weld "smile" from the Gypsy Font cartridge. I used a sponge and Stampin Up green galore ink pad to stamp each of the pages green. This is my daughter's favorite page in the book. This cupcake is a sticker I bought a while ago from Target. Doesn't it look yummy? I know you can't see each individual page but I wanted to give you an idea of what the inside of the book looks like. For this Throwback Thursday Challenge you could use a "lite" cartridge but since I do not own one I thought that I would use Accent Essentials for the bone background and one of my favorite carts "Just Because" cards. I haven't made a page in a long time and wanted to make one for my fur babies as Emma says. I again LOVE The Ultimate Crafter's Companion. I used this to make the bow cause as you know I don't do so well without it. I also used this new stuff that I have never used before and was kind of skeptical about cause I love me some pop dots. It is Collall Decopage 3D...omg I LOVE it!!! So how would you like to win this? Paper, vinyl, glitter and I think I see one of our new awesome albums!! If you'd like to win this, enter our giveaway!! I made this card for the Peachy Keen Stamps Sketch Challenge 49. I am not quite sure that all the colors go together but I think the faces on the flowers just makes me smile. I made this card for My Pink Stamper Friday blog hop. For this challenge you had to make anything birthday so since I am loving the Simply Charmed Cricut cartridge I thought I would use it for this project. I also used my Gypsy to weld the card together and used the shadow feature to adhere the card to the black background. I LOVE these S.W.A.L.K stamps over at Crafter's Companion online store. They are soooo adorable. The name of this stamp is "A Little Note" by S.W.A.L.K. I made this cute bow with my Ultimate Crafters Companion. It was so easy to make a bow with this tool and I have never been able to tie one before now. I wanted to show you the stamp set that I am giving away from Crafter's Companion called Patchwork Polly - Chloe. It is adorable. You can see that I am not a very good at coloring but with time I will get better. :) For the card I used "Just Because" cards Cricut cartridge and the paper is DCWV The Blossoms & Butterflies Stack. I used my iRock & rhinestuds to bling up the card a bit. Last but not least for the bow I used one of my new favorite "toys" The Ultimate Crafter's Companion from Crafter's Companion. I love the bow maker because you can make a beautiful easy bow in a snap. Don't forget about the Crafter's Companion month long giveaway. I love all the colors that come along with Easter. I made this card for my daughter for Easter. I think she is going to love it. For the face I used the adorable PKS set Wide Eyed and Bushy Tailed. DCWV The dots, stripes, & plaids matstack for the background and Stampin Up pink (don't know the exact color) for the card base. Scallop dot punch from Martha Stewart, pink stickles, blue & pink ribbon. For the stamped sentiment I cute it out using Accent Essentials Cricut cartridge, stamped it with an Easter stamp and the ink is positively pink from Stampin Up. I made this card for a friends birthday coming up this month. I love the Happy Lashes PKS face. They are so adorable. I love their stamps. For the flower I used Simply Charmed Cricut cartridge. I made the card base using The Ultimate Crafter's Companion from Crafter's Companion. I stamped the sentiment from the stamp set called Wow, So Many Candles from My Creative Time. For the paper I used Crafter's Companion brights cardstock pack and DCWV The Whimsy Stack. You can't see it in the picture but the flower wobbles...yep I used a wobble from AWI to adhere the flower to the card. It is so fun and I love showing it wobble. 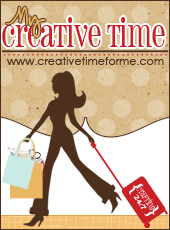 This card was made for the My Creative Time Throwback Thursday challenge. It was a Cricut-less challenge which was a challenge for me. haha. I love my Cricut so this took me a minute. Not to mention I don't really have allot of "other" stuff to make a card with. If that makes any sense. I don't own allot of stamps or stickers or such things so I used DCWV The Pets Stack and cut out the sentiment and the paw print from the stack. I used the scallop dot punch from Martha Stewart, brown ribbon and of course Crafter's Compaion brights cardstock and also from Crafter's Companion...The Ultimate Crafter's Companion to make my card base. Crafter's Companion USA is celebrating their new information blog in style. Members of their design team are giving away some of their fabulous products to one lucky U.S. resident. Every single blog will be giving away a beautiful stamp set, a package of Rock-a-Blocks and permanent double-side adhesive tape runner. Rock-a-Blocks, permanent double-side adhesive tape runner. and the Patchwork Polly - Chloe stamp set. I have this stamp set, and I LOVE it. 2. Post or put on your sidebar a picture of one of the Design Team's giveaway on your blog or facebook page and link it back to Crafter's Companion USA Information blog. Once you have done this, simply leave one comment with the link to your blog or facebook page below. You only need to post one of our giveaways to enter all of the design team members' giveaways. So you'll have 8 chances to win! 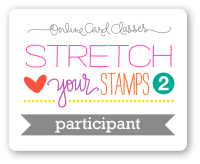 You will want to visit every blog because EACH of the DT members will have a DIFFERENT Stamp set to give away! The giveaways will run from April 1st to April 30th. The winners will be posted on our blogs May 1st.